Uruguay reached the World Cup semifinals for the first time since 1970, beating Ghana 4-2 on penalties Friday after the last African team in the tournament was denied victory by a cynical handball and a missed penalty in the last seconds of extra time. The two-time champion Uruguayans advanced to face the Netherlands in the semifinals after Sebastian Abreu casually chipped the last penalty straight down the middle to secure the win, after a 1-1 draw following 120 minutes of play. Asamoah Gyan had a chance to secure Africa's first ever World Cup semifinal spot for Ghana, but he hit the crossbar with a penalty after Uruguay forward Luis Suarez was sent off for handling the ball on the line. Uruguay goalkeeper Fernando Muslera then made two important saves in the shootout. "To be among the four best (teams) in the world, there are no words for that," said Uruguay forward Diego Forlan, who scored a second-half equalizer with a free kick in the 55th minute. "We felt we were going to faint with each penalty." Gyan, who'd converted penalties to secure a win over Serbia and a draw against Australia in the group stage, bit his jersey and walked away with his back to the goal when he missed the chance to secure a semifinal spot. "It has been a very difficult moment," Ghana Football Association president Kwesi Nyantakyi said in a television interview. "Our boys played very well, beautiful football. "If it was meant for us, less than a second to go, we would have won the match. It has been a terrible moment for the entire continent, not just for our nation." Gyan put it down to "hard luck," but was convinced the ball had crossed the line before Suarez touched it, and the goal should have counted. 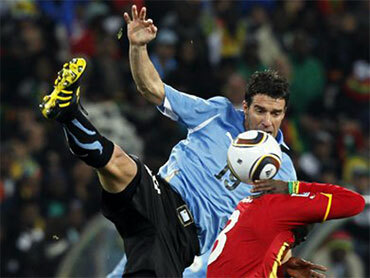 "We had (an) opportunity to win this game but unfortunately that is football for you," Gyan said. "The ball went in, it did cross the line, and the referee disallowed it." In regulation, Sulley Muntari gave Ghana the lead with a 35-meter (yard) left-foot strike seconds before halftime, but Forlan equalized with a curling, 20-meter (yard) free kick from the left 10 minutes after the break. Ghana picked up the tempo in the dying stages of extra time and had other chances to win. Kevin-Prince Boateng missed with a header in the 118th in the midst of three defenders. He sent in a cross from the left in the next minute which Muslera had to save at the near post. Suarez was given a direct red card in the last minute for batting away Dominic Adiyiah's header with his arms after he'd already blocked Stephen Appiah's shot on the line. After Gyan missed the ensuing penalty, Muslera kissed his glove and touched it to the bar, and Suarez ran into the tunnel pumping his arms and celebrating the reprieve. He was later hoisted onto the shoulders of his teammates as they celebrated the win. Forlan said Suarez had saved the game for Uruguay. Coach Oscar Tabarez defended Suarez from suggestions he'd cheated Ghana out of a win, saying his handball was nothing more than an instinctive act. "He was thrown out of the game, what else do you do with Suarez?" Tabarez said. "Do you blame Suarez for Ghana missing the penalty? I don't like the word cheating. I don't think the word is fair." Support for Ghana has continued to grow this week as the only one of six African teams in the tournament to progress past the group stage. Red, yellow and green flags with the black star at its center were all around the stadium as people united to support the last team from the continent still in the first World Cup on African soil. The partisan 84,017-strong crowd booed loudly when Forlan was successful with the first penalty of the shootout, and cheered wildly when Gyan angled his first shot into the top right corner to make it 1-1. Ghana captain John Mensah was the first to miss, giving Uruguay a 3-2 cushion, but the Africans stayed alive when Maximiliano Pereira missed the next shot and the crowd cheered wildly again. But when Adiyiah's next kick was saved by Muslera, Africa's exit was almost sealed. After Abreu secured the win, Gyan was inconsolable as he left the field in tears. Uruguay, which won the World Cup in 1930 and 1950 but hasn't been to the semifinals in 40 years, was the fifth and last South American team to qualify for the 2010 edition when it beat Costa Rica in an intercontinental playoff. Ghana was unable to improve on Africa's best showing at the quadrennial tournament. Cameroon was the first to reach the quarterfinals in 1990 and Senegal matched that in 2002. Uruguay started strongly, dominating the opening 30 minutes, with Forlan and Suarez finding space and creating opportunities that they were unable to convert. Kingson stopped Suarez' shot in the 11th and punched away Forlan's 40-yard free kick in the 15th. The goalkeeper then stopped one chance with his face in the 18th after it deflected off Mensah's chest. Then it was Ghana's turn to attack, with Gyan, Boateng and Muntari having opportunities in the 15 minutes before halftime. Boateng's was the most spectacular, with his bicycle kick in front of goal to Samuel Inkoom's chipped pass sailing over the just crossbar. Ghana and Uruguay each had chances to pull ahead in the second half of regulation time, including Suarez' volley at the far post which crashed into the side netting in the 63rd. Suarez will be banned for at least one match for the red card. Uruguay: Fernando Muslera, Diego Lugano (Andres Scotti, 38), Mauricio Victorino, Jorge Fucile, Maximiliano Pereira, Alvaro Fernandez (Nicolas Lodeiro, 46), Diego Perez, Egidio Arevalo, Edinson Cavani (Sebastian Abreu, 76), Luis Suarez, Diego Forlan. Ghana: Richard Kingson, Hans Sarpei, John Pantsil, John Mensah, Isaac Vorsah, Anthony Annan, Samuel Inkoom (Stephen Appiah, 74), Sulley Muntari (Dominic Adiyiah, 88), Kwadwo Asamoah, Kevin-Prince Boateng, Asamoah Gyan.